Do you want extra padding, to protect your mattress, AND to stay cool at night? Time to check out a cooling mattress pad! We’ve researched and reviewed some of the best-selling mattress pads with cooling properties to provide you with an easy path towards better sleep. If you’re not sure what you’re looking for, check out these specs to consider on your journey to cool sleeping bliss! Waterproof: Waterproof mattress pads are a great feature for protecting your mattress from spills and other damage. Cover Material: Cover material is a big factor of breathability and thermo-regulation. Memory foam, cotton, and bamboo rayon are common. Hypoallergenic: Most mattress pads today are designed to be hypoallergenic--no allergy-inducing fabrics, and they block dust mites. Machine Washable: If you have allergies or are worried about spills, it’s nice to be able to machine-wash your mattress pad periodically. Size: Need a specialty size like Twin XL or Split King? Pay attention to the list of available mattress pad sizes! Warranty: Mattress pads tend to come with longer warranties up to 15 years, although some have shorter 1-5 year warranties. Ready to get RESTED? Then let’s do this! Our top pick and budget pick summarize our best finds among cooling mattress pads and protectors. If they don’t have the features you’re dreaming of, keep reading! We’ve got a range of mattress pads on our list for you to consider. This is a rare time where when you snooze, you DON’T lose! The FBG Sleep Chill CoolMax Mattress Protector is our top pick for the best cooling mattress pad protector. It’s available in Twin-King sizes as well as specialty sizes like Split King, California King, Twin XL, and Full XL! If you’re looking for a mattress protector that feels like a mattress pad and won’t make you hot, this pad is a great option. The CoolMax fabric uses a textured polyester design to improve breathability over the layer of padding and bottom layer of waterproof fabric. You can also machine wash this pad on cool, gentle settings and tumble dry on low. The ten-year warranty is another great feature! It’s a great padded mattress protector that won’t crinkle or slip around under you when you’re trying to get a restful night’s sleep. If you’re looking for more intense padding, a gel-infused memory foam topper (like the one we reviewed!) might be a better cooling option for you. 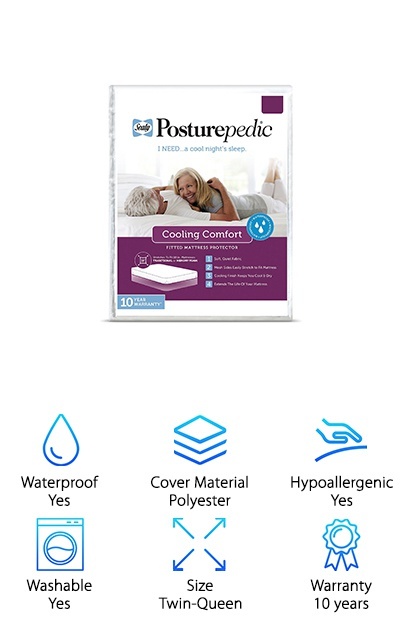 If you need a mattress protector that doesn’t retain heat, the Sealy Posturepedic Cooling Mattress Pad brings all of the waterproofing and none of the crinkling and high temperatures. Available in twin, full, or queen sizes, this machine-washable and hypoallergenic mattress protector also has a ten-year warranty! It fits mattresses up to 18’’ deep. Wash it on cool, gentle settings and tumble dry on low for best results. It has a soft polyester knit top fabric that wicks moisture and breathes well. Now, if you’re looking for a waterproof mattress pad that won’t feel like the ones you used to sleep on as a kid, this is a great option. It’s designed not to change how your mattress feels and won’t make you feel like you’re slipping around when you’re trying to get comfortable. However, if you’re looking for more padding or a more intense cooling effect, check out our other mattress pad reviews below! 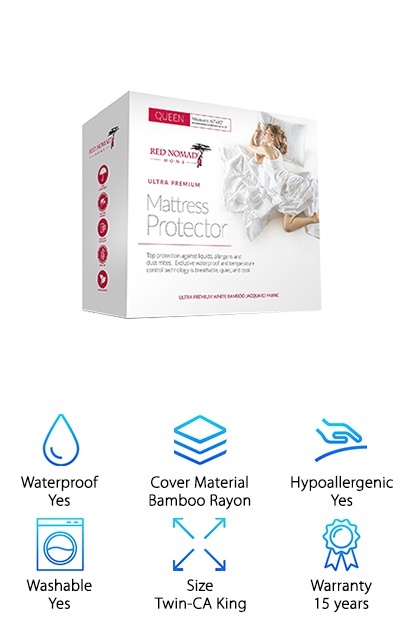 The Red Nomad Bamboo Pad Mattress Protector provides a liquid-proof barrier beneath a soft and lightly padded bamboo rayon top. Protect your mattress without the crinkling, slipping, and heat-retention of traditional waterproof mattress protectors! The bamboo rayon CoolFlow cover material is thermo-regulating and breathable to keep you comfortable and cool. The cover fits mattresses as deep as 18’’ and is machine-washable (wash on cool, gentle settings for best results). The size options cover the full range of mattress options, including Twin XL and California King. If you want to protect your mattress without paying a “sweat tax” every night, this bamboo pad is the solution you’re looking for! For a more intense cooling and supportive effect, you may prefer a gel-infused pad. If you’re a college student living in the dorms, you definitely want to protect that Twin XL mattress and add a soft layer. While many cooling mattress pads are made to balance out memory foam mattresses, which can retain a lot of heat, the Capsa Sleep Memory Foam pad is made for people who want to sleep cool and want memory foam in their lives! This mattress pad is made from breathable gel-infused memory foam with an open cell structure to improve airflow and dissipate heat and moisture better than traditional memory foam. It’s a luxurious two inches thick but is an inch shorter on all sides to keep your fitted sheets fitting well over top of it. The pad is available in conventional sizes as well as Twin XL and CA King. It’s not machine-washable, but can be vacuumed or spot cleaned with a soap/water spray. For a cooler alternative to traditional memory foam mattress pad, it’s hard to beat the Capsa gel-infused memory foam! Fitting Twin to King-sized mattresses, including Twin XL and California King, the ExceptionalSheets Bamboo Pad is a great option for college students living the dorm life as well as people sleeping on an extra-long California King mattress. 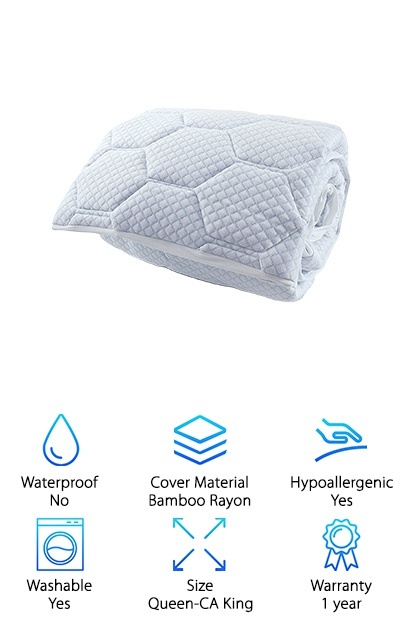 This mattress pad has a top cover of rayon from bamboo, which is known for its thermoregulation abilities--it doesn’t trap heat, which helps keep you cool! The pad is stuffed with hypoallergenic RevoLoft cluster fiber fill, which feels like goose-down and is designed for optimal air flow while holding its shape. The result? A thick, luxurious mattress pad that won’t get overly hot! The pad can be machine washed in cold water on the gentle cycle and dried on low, so it’s easy to refresh it periodically. This mattress topper uses double needle baffle box stitching to keep the fill from shifting around, which solves a common issue with many mattress pads! The Night Guard Cooling Cover provides plush softness without heating you up at night. If you want a heavenly-soft mattress pad but tend to be a hot sleeper, this cooling cover is the best of both worlds. Stuffed with soft fleece inside of a terry cotton cover, the mattress pad has a fitted skirt that fits mattress depths up to 18’’. It’s machine-washable and hypoallergenic, so it’s an easy way to bump up the comfort of your current mattress, whether it’s too firm, too hot, or just getting old. This overstuffed mattress pad is filled with fleece and poly fill. It also has a water-resistant polyurethane barrier at the base to help protect your mattress. If you’re on the very hot end of being a hot sleeper, you may prefer a cooling gel mattress pad or even the BedJet system to keep the sweating to a minimum! 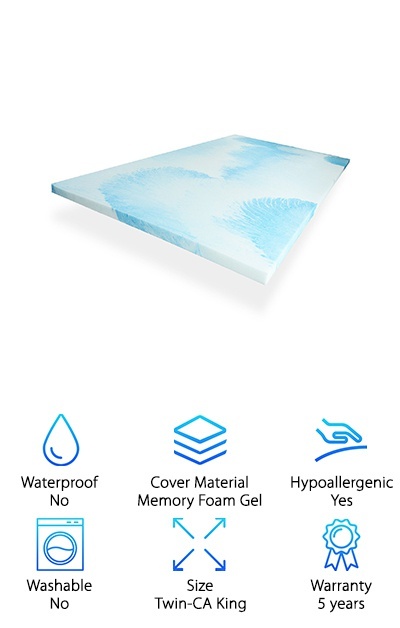 The Rio Home Fashions Cooling Mattress Pad features a layer of cooling gel-infused memory foam over a soft, supportive hypoallergenic fiber layer. It’s all covered in bamboo rayon fabric for additional breathability and thermo-regulation. The pad is available in Queen, King, and California King sizes and has a stretchy fitted skirt to fit mattresses as deep as 22’’. It’s hypoallergenic (great for dust mite allergies) and machine washable, too, so it’s easy to care for! If you want a cooling mattress pad that provides extra padding and support, this gel memory foam pad is a great option. It’s not waterproof like a mattress protector but is more focused on dispersing heat and keeping you cool. 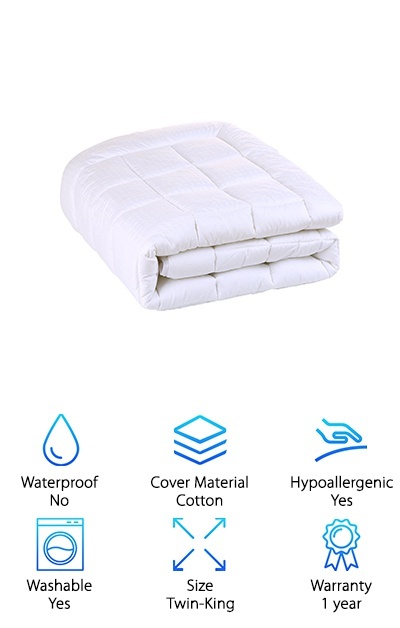 Especially if you have a memory foam mattress that tends to retain heat, you’ll enjoy this mattress pad as a cooling, thin, and supportive addition to your nights! 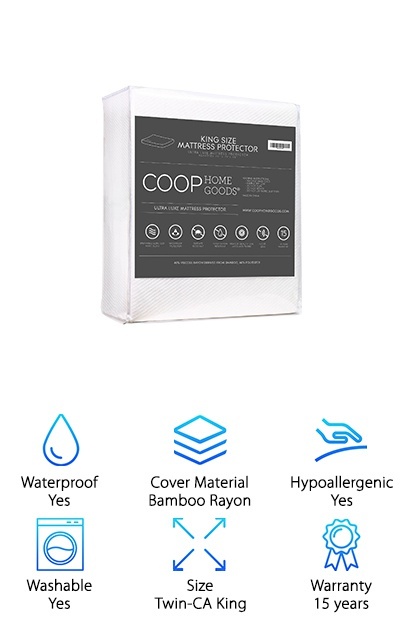 With a cooling cover made from 40% viscose rayon from bamboo and 60% Cooling Lulltra polyester, the Coop Home Goods Lulltra Mattress Pad comes in Twin to King sizes, including California King. 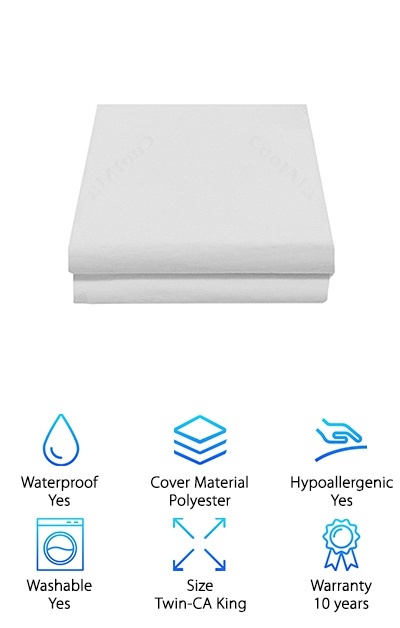 This cooling waterproof mattress pad isn’t crinkly or slippery and uses a fitted sheet design to easily fit mattresses up to 18’’ deep. It’s hypoallergenic and machine-washable-- just wash it on cold and air dry or tumblr dry on low! The breathable fabric helps you keep cool throughout the night while also protecting your mattress from accidental spills and stains. If you need a mattress cover that doesn’t feel cheap and plasticky, try out the Lulltra! It has a great 15-year warranty on top of having a breathable, thermo-regulating design. 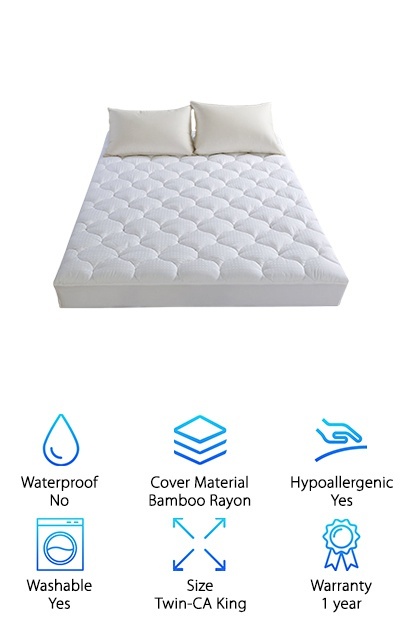 If you want to protect your mattress without sweating through the night, this bamboo rayon blend mattress pad might be a perfect fit. Technically not a mattress pad, but hear us out: do you want your bed to stay cooler? Do you share a bed with someone who just wants to be warm and cozy? To keep your relationship from falling apart, you may want to look into the BedJet! 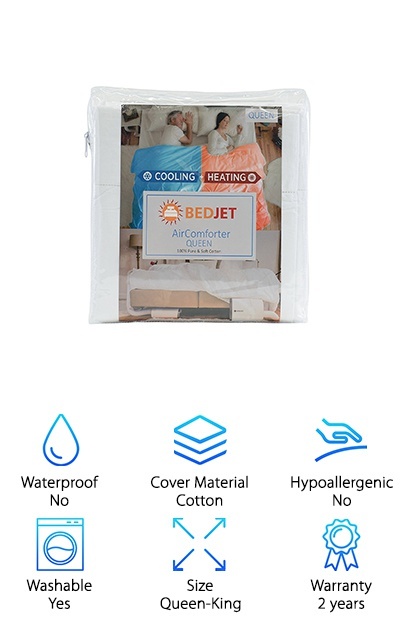 This comforter combines with the BedJet Climate Comfort System to actively heat or cool each side of the comforter separately. You can sleep on the cool side while your partner gets their side warmed up! The comforter has internal air flow cavities inside of a 100% cotton outer cover to provide cooling power where you want it. The comforter is also machine washable for convenience. It’s a great solution to sharing a bed with someone who has different temperature preferences than you do, and keeps everyone happy! For long-term relationship bliss, you may want to check out the BedJet system. 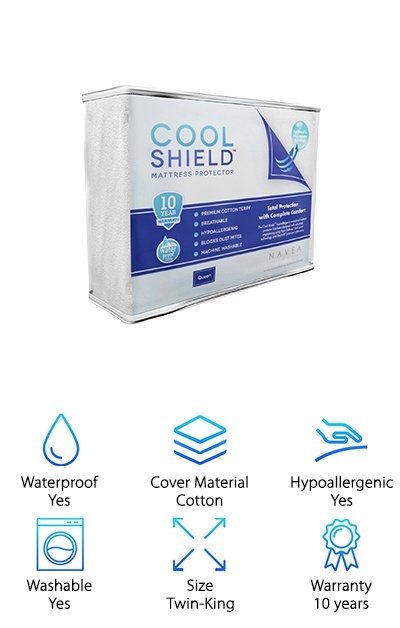 The Cool Shield Mattress Protector comes in Twin to King sizes, including Twin XL for all you college students out there! It’s waterproof and hypoallergenic, so it’s a good option if you suffer from dust mite allergies. The fitted sheet style fit makes this mattress protector easy to take on and off, and it’s machine-washable as well. Just wash it on cool or warm settings and let it air dry to preserve the waterproof material. The thin cotton terry top fabric doesn’t retain heat and also doesn’t change the way your mattress feels underneath it. If you love your current mattress but want a cooling mattress protector, this option may work well for you. Help save your mattress some wear and tear and stay cool at night with this mattress protector. And if you’re living in a dorm with no air conditioning… get the Twin XL size, stat!